I have a huge amount of respect for Toyota CEO Akio Toyoda, and just when I didn't think he could rise any higher in my book, he shows up to a talk at Meiji University dressed like just raided the Bonobos catalog to try and get young people excited about cars again. Toyoda races cars for fun, wants Toyota to make the fun cars we all miss so much, pushed hard for our beloved Toyobaru, and takes so much pride in his family's company that he actually teared up during Congressional hearings over their massive recalls a few years back. He's a man who is good at what he does and has fun doing it. Basically, Akio Toyoda is cooler than you. He's cooler than everyone. No one knows it, but they should! So after Toyoda made news for speaking to the university kids wearing "khaki pants rolled up above the ankle, a square-ended crimson tie, black wayfarer glasses and a trendy hairdo," I decided to come up with a meme to educate the world on how cool Akio Toyoda is, and to do it I borrowed this photo tweeted out by Lexus UK. The man knows how to dress. 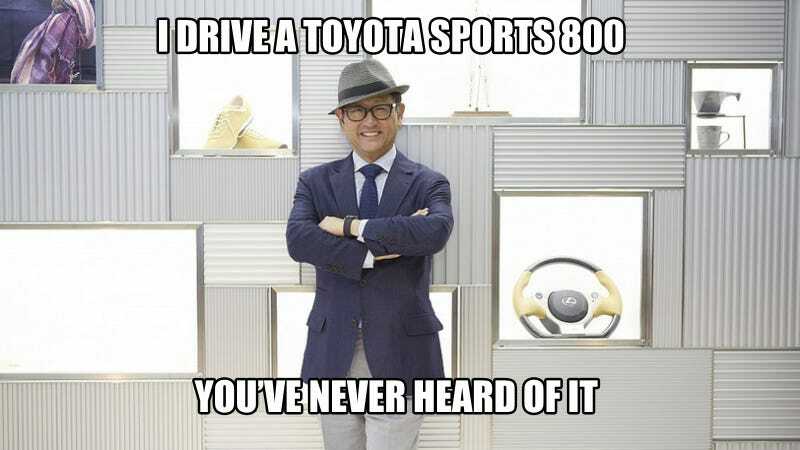 Everyone, meet Hipster Akio Toyoda, the Japanese car executive who is cooler than you'll ever be. Feel free to come up with your own. If Mr. Toyoda happens to read this, I promise him it's all in fun. And because I'm jealous of those suits.